Worshiping The Sound: Temples In Madison TONIGHT (4.25.14) | True Endeavors Presents: music, tours, tickets, mp3 downloads, concert pictures, videos, Madison WI. Close your eyes when you listen to Temples’ “Shelter Song.” The opening chords are comfortable and familiar. The warm, jangly guitars, the rolling drum fill, the call-and-response vocals and the intonations, the keyboards. On their lead single from their debut album Sun Structures, Temples manages to evoke an entire decade of psychedelic influence. As the album progresses their influences at times grow more modern, and the band manages to distill all of it into something unique. 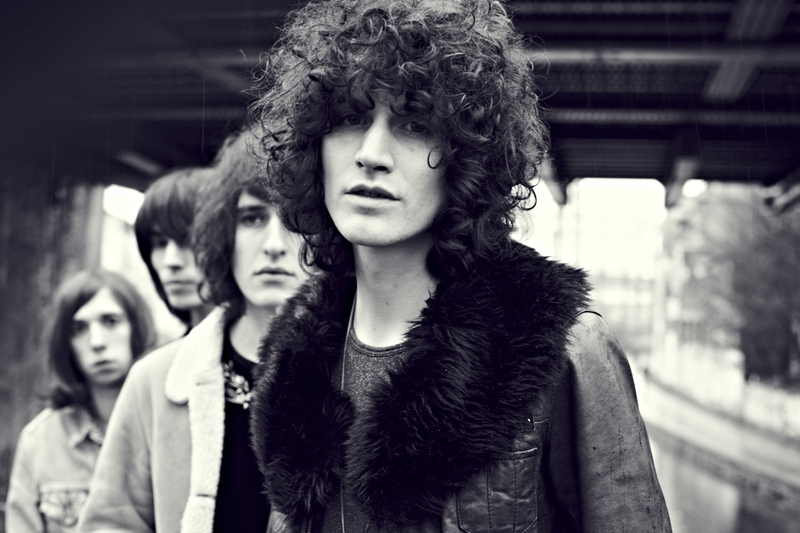 Temples’ unique sound is what gave them their unlikely start. Guitarist James Bagshaw and bassist Thomas Warmsley, veterans of several bands together, published a few of their home-recorded songs to YouTube. As if straight from of an aspiring musician’s daydream, a producer heard their songs and jumped to release their first single, the aforementioned “Shelter Song.” With the additions of drummer Samuel Toms and keyboardist Adam Smith, the band started touring Europe aggressively, including regular festivals gigs. During that time they opened for fellow English psych bands Mystery Jets, Stealing Sheep, Kasabian, and Tame Impala. Within a year of playing out live Temples began headlining shows on their own and selling out venues across Europe. This year Temples continues the same, frenzied pace with more shows in Europe and a US tour that criss-crosses the country from Coachella to Austin Psych Fest, including a stop at Madison’s High Noon Saloon tonight (Friday, April 25). All of this from a band who has only been playing together for 18 months. The next time they roll through the Midwest you won’t likely be able to catch them at a nice, intimate stage like this. Also opening for Temples are Madison’s own Squarewave, a psych-folk band comprised of Jeff Jagielo, Patrick Connaughty, and Brandon Smith. Jagielo has been making music in Madison since the mid 80s when he formed the long-running Ivory Library, which also included Connaughty. Following the disbanding, Jagielo and Connaughty continued to make music together, resulting in the new band Squarewave, releasing three albums to local critical acclaim. Catch all three bands in Madison tonight at the High Noon Saloon. sped is amazing. It kind of feels tthat you are doing any distinftive trick. since you surely possess tthe gift. I know this is totally off topic buut I had to share it with someone! I have a mission that I am simply now working on, and I’ve been at the glance out for such information. influence on a nation’s currency.